Historically one of the most popular Northern Hemisphere extra virgin olive oils, the Portuguese Cobrancosa is viscous and complex. Layered with creamy flavors, green herb & green fruity undertones of green apple and almond. This unique Portuguese variety has developed a loyal following. Very low FFA and high smoke point. An exquisite example of Italy’s finest EVOO which stands out due to its complexity. Pungent with a peppery aftertaste yet buttery smooth. A perfect blend with “traditional” balsamic vinegar as a dressing for grilled vegetables. Kalamata olives of Greece have produced an exceptional EVOO which is smooth, fresh and full bodied. Cold pressed at harvest using no chemicals or preservatives. Very essential part of a healthy diet! Fresh wild Rosemary is crushed with Organic Chemlali Olives to form this “agrumato” that embodies the heart and soul of Rosemary. Both complex and aromatic this oil is perfect with lamb, poultry and pork. Spectacular drizzled on grilled vegetables and roasted potatoes. All natural product of Tunisia. As blood oranges and Tunisian olives ripen, they are pressed together to form this beautiful “agrumato”, or combination of cool, fresh citrus fruits crushed with olives. Fruity, rich and unique, this is a favorite for its incredible versatility! Eureka Lemon Oil is produced by pressing whole fresh lemons together with early harvest, certified organic olives at the time of crush. Its light, refreshing flavor is just perfect to sauté shrimp or scallops or to drizzle on chicken or fish. All natural. No artificial flavors or ingredients. This classic medley of French herbs is a showstopper when drizzled over grilled chicken, or rubbed on turkey before roasted. With notes of savory thyme and bay leaf, this oil can be used to dip bread in or as the base for your homemade aiolis. Enjoy the taste of the Italian countryside with this delicious medley of herbs, sundried tomatoes & garlic. This versatile oil is so delicious, you will want to use it on everything from salad dressing to marinades or just for dipping bread. This incredible olive oil gives off the flavor of slow roasted garlic. Since garlic and olive oil are almost always used together in Mediterranean cooking, you can use this in just about anything! Fresh basil infused in Italian extra virgin olive oil is pungent and aromatic. The king of herbs comes to life in this Italian specialty. Perfect for a pesto, on fish or just for dipping crusty bread. A connoisseur’s olive oil! If you like the flavors and aroma of black truffle, then you’ll love this oil. Made in Italy in artisan fashion, without the use of any extracts or perfumes, this pure olive oil is smooth while having an unmistakably intense black truffle flavor. Produced in the traditional Modena style and aged up to 18 years in oak barrels, this balsamic is very diverse, thick and potent. 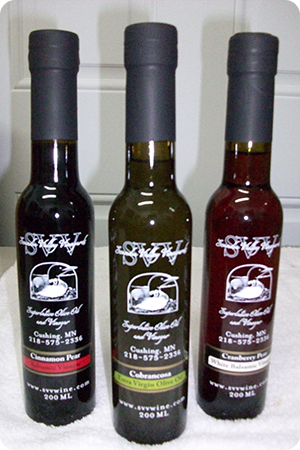 It is balanced enough to pair with any of our olive oils. The acidity of this balsamic makes it pair extremely well with sweet foods such as fresh fruit or ice cream. It will add complexity, richness and depth to anything it is paired with. Rich and sweet, our all naturally infused Black Cherry Balsamic is made with wood barrel aged premium vinegar in Modena. 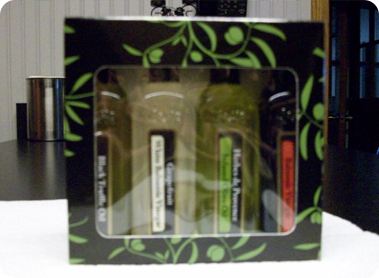 Enjoy in vinaigrettes, on salads, as a glaze for meats or poultry or try serving with most any hard cheese. Outstanding! This delightful balsamic is spicy and warm, perfect drizzled over fresh fruit for dessert. Also a great compliment drizzled over brie or goat cheese! This thick, rich, perfectly balanced balsamic oozes with the natural flavor of fresh, ripe raspberries. As aromatic as it is flavorful, the intensity of this balsamic lends complexity, depth, richness and a bright flavor to anything you add it to! A dark Italian balsamic infused with fresh blueberries is great drizzled over grilled asparagus or brussel spouts. A sweet topping on plain yogurt or even pancakes. Fresh peaches infused in Italian balsamic vinegar is a delicious dressing to any salad, lettuce or fruit. Great as a marinade for chicken or fish prepared on the grill. Try a few drops in sparkling water or iced tea! Creamy, sultry Madagascar vanilla and fresh Cara Cara oranges are infused in dark balsamic vinegar for a truly versatile condiment. Delightful in vinaigrettes, marinades, fruit salad or drizzled over yogurt. Try on pancakes, as well. Light and fruity, this versatile white balsamic is fantastically fresh tasting with the tart bite that cranberries are so loved for. Juicy, tart wild raspberries from Cascadia are infused with luscious white balsamic to create a versatile condiment. Use as a glaze or marinade for poultry of Salmon. Toss with fresh greens or drizzle over freshly cut fruit as a salad dressing or pair with Gremolata Olive Oil for a beautiful vinaigrette. Sweet and tart with an intense aroma of honeysuckle. Wonderful on grilled chicken or drizzled on your favorite cheeses. Blend with extra virgin olive oil (Cobrancosa or Coratina) for a unique salad dressing. Awesome spicy and sweet with just a hint of heat. Our Jalapeño Lime Vinegar brings a unique flavor perfect for grilled chicken or try marinating shredded cabbage (coleslaw) for topping fish tacos! Also, a secret ingredient for your next margarita. There is a FungusAmongUs. This gourmet Sea Salt is a unique seasoning with the distinctive flavor and aroma of Rare Truffles. Wonderful on eggs, in meat dishes and on popcorn. 60 ml bottles of all oils and vinegars are available. Four 60 ml bottles in an attractive windowed gift box. Customer selects what varieties and each Gift Box is made to order. Prices are $15.99 to $21.99 depending on selected varieties.